Heteromeles arbutifolia- Toyon- or as it's sometimes called, Christmas Berry, is an evergreen shrub to small tree that usually grows to 6-8 ft. high and 4-5 ft. wide. 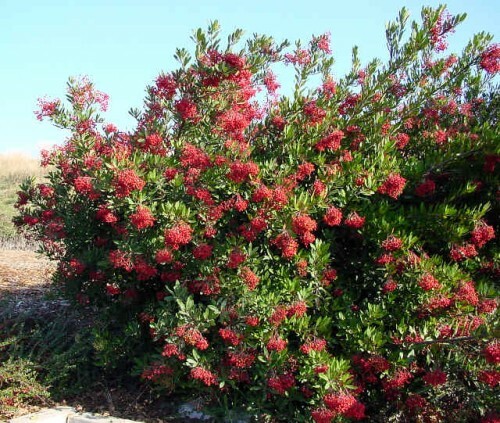 Toyon can go to 15-20' tall if it's old and happy and become a delightful evergreen multi-stemmed tree with white flowers in summer and red berries in winter. Toyon is native to much of California and is drought tolerant after the first few years, but tolerates some water if drainage is good. Fire resistant if watered a little every two weeks during spring and summer. Toyon likes full sun, tolerates full shade. Tolerates serpentine based adobe soils, but also lives in beach sand. It is hardy to 5 degrees.